Advanced Framing or Optimum Value Engineering (OVE) uses stacked framing with single top plates such that trusses line up with 2nd story wall studs, which line up with 2nd story floor joist, which line up with 1st floor wall studs such that loads are transferred directly down through the structure. This means that wall studs need to be spaced appropriately to line up with members above. Unfortunately, I don't see a way to set an offset where to place the second stud within a wall. 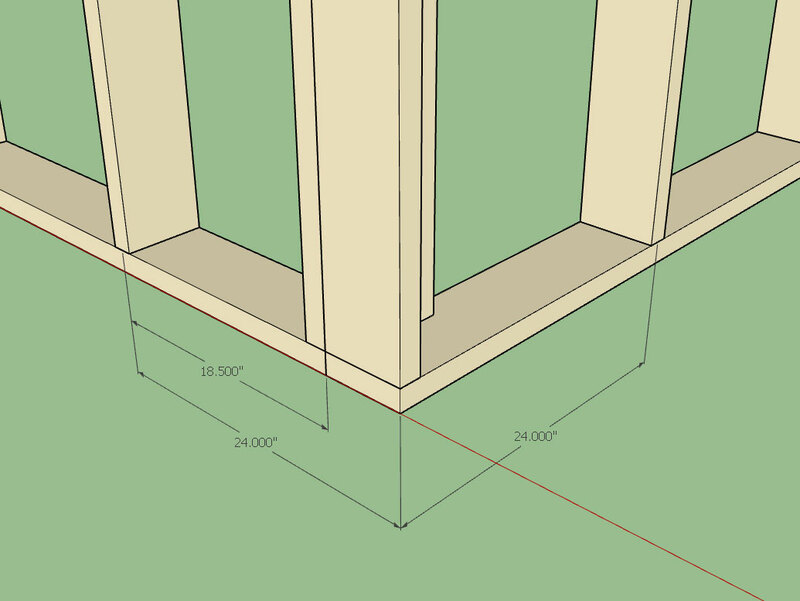 For example, and for a 2x6 wall with stud spacing of 24" and a wall placed inside a perpindicular adjacent wall, I want to place the middle of the second stud at 18.5" in from the end of the wall. Now if I include the width of the adjacent perpendicular wall (5.5") plus the distance to the middle of the second stud (18.5"), I get a stud 24" away from the corner which lines up with the 2nd story floor joist, second story wall stud, and roof truss. Is it possible to add a "stud offset from start of wall" parameter to allow precise placement of studs within a wall, or is there some other way to achieve precise stud alignment? Where you have an inset wall (versus outset wall) the plugin should take into account the 5.5 inches and space the studs accordingly. However in certain circumstances an offset could probably come in handy where you want to fine tune the stud spacing start point. I'm also looking at providing the option for eliminating the trimmers around windows and doors. It might be a simple modification or it might require quite a bit of jiggering to the logic I won't know until I really dig into the code and start testing it. I have tried this and it does seem to space studs appropriately around corners, but after placing the first wall, the second wall tends to back track and start on top of the first wall. This "back tracking" changes the first wall so it is shorter than desired and in my case it happens to be a balloon wall that can't have its length changed. I've tried to figure out "Wall Corner Start" and "Wall Corner Stop" in the "Draw Rectangular Wall Assembly" dialog so as to have direct control over where a wall starts and ends in polyline mode, but it eludes me. Is there a way within polyline wall mode to have the second wall start on the inside of the first wall and then the third wall to start on the outside of the second. The first and third walls are balloon walls on gable ends so I don't want them to get manipulated. This is why I thought building individual walls with an offset might work. We probably need to do a Skype session so I can see better what your doing and understand fully the issues firsthand. Also note that Version 1.0.6 has just been released which allows for eliminating the trimmers around window and door openings. Tried out 1.0.6 and its awesome! No trimmers and custom header added for non-bearing walls. Thanks! Looks good, I'm not a big fan of advanced framing from a structural standpoint but I can see the reason for going this route. At some point it might be useful to allow the user to automatically insert hangers for the headers.